LIMOGES PORCELAIN BOX WITH 'PV' POTTERY MARK QUERY:- Hello, I just acquired a little ceramic and enameled pill box or Trinket Box at an estate auction that is clearly labeled on the back "Limoges France Peint Main P.V." I have seen PV France by itself on other items and am trying to find out what the P.V. stands for and of course the time period. Hello, and thank you for your enquiry. These initials (P.V.) refer to PARRY & VIEILLE (Limoges, France) - ca 1970s to 1990s, a Porcelain Decorating Workshop (Atelier) that purchases Porcelain or China blanks from nearby Factories and has them decorated in their Studio for sale at Gift Shops and Visitor Trade outlets. Thanks for that John, another mystery solved. 'PV' POTTERY MARK ON LIMOGES PORCELAIN BOX: Thanks to John for taking the time to share a common pottery mark query with us. So everything that has a Limoges porcelain mark isn't a priceless antique then! It is good insider knowledge like this which is very useful to our visitors, so is very much appreciated. 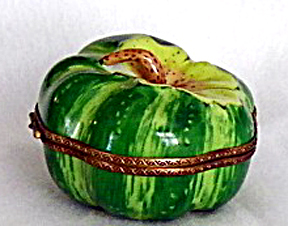 I recently read that Parry Vieille Limoges boxes will become more rare and desired, since they will no longer be made. Is this true? PV is NOT Parry Vieille Necessarily! A clear, un-stylized, "P.V." stands for "Peasant Valley" and indicates a trinket box made in the Czech Republic. The Parry Vieille mark is a highly stylized "PV" in which the "V" almost looks like an "H."